I always celebrate New Year’s Eve in Jibe’s Beach Club with our guests and friends with a big buffet BBQ dinner, music and dances. 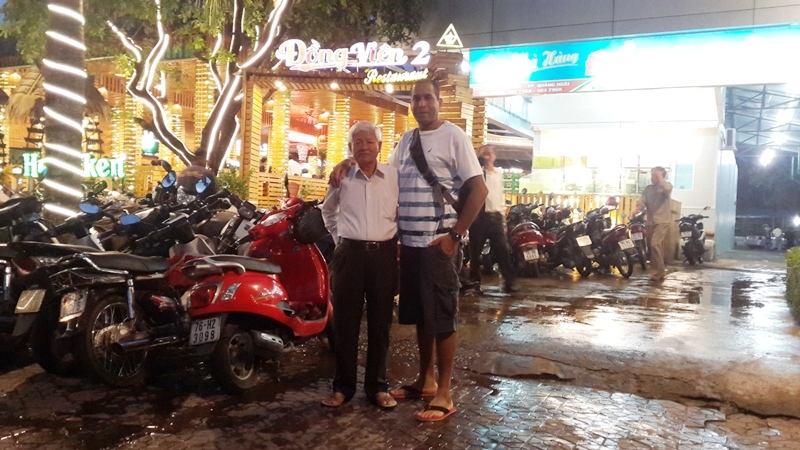 I’ve been living in Vietnam for over 20 years, running resorts and water sport centers and organizing sports events. In 2015, I celebrated 20 years here and I love it though last year was a bad year for business here for many reasons and some erosion on the beach here in Mui Ne is affecting the area. For 2016, I wish for better performance of our business as well as some improvement to infrastructures for tourism in Mui Ne, Phan Thiet. I will find sponsors to host again an event of the PWA World Cup Wind Surfing 2016 and improve my golf game. Wish for peace in the world and continue to live healthy and happily with my family. 2015 is my first full year in Vietnam. I am working on the construction of the first urban railway in Ho Chi Minh City and I have enjoyed living in Vietnam very much. I find it easy to live here, no problems except the usual moans and groans about the traffic and it's a shame that there is a small minority of people who don't know the difference between a public toilet and the street. I will meet up for dinner with some friends tonight and then find a place where we can be within arm's length of a drink. Shortly after midnight we will cross arms across our chests and hold hands in a circle to sing "Auld Lang Syne" – a Scottish folk song that means Old Time's Sake which is traditional at this time of year in the UK. We will try to teach any locals nearby the words too – if we can remember them ourselves! I will be up fairly early, around 7:00 am, to send greetings to friends and family as it turns midnight in the UK. If I was in England, we would have dinner for friends and family at home. Just before midnight we send a tall, dark man outside of the house to do "First Footing.” We let him back in after midnight as the first guest of the New Year. He should give us some things for luck like a silver coin (wealth), coal (warmth), whisky (friendship), then we sing "Auld Lang Syne" together. These days of course it is a tradition wherever you are in the world to get on the phone as soon as possible after midnight to send Happy New Year messages. The best part of the UK to be in at this time of year is Scotland where "Hogmanay" is much more important than Christmas for most people – they have 2 public holidays on Jan 1st and Jan 2nd to recover from their parties! I don't have too many specific wishes for 2016, my daughter is having an important year at school so I hope she is able to do well. I have been on a few trips to see more of Vietnam in 2015 and hope to travel a bit further north and maybe to your neighbors in the next 12 months. ​I will celebrate New Year’s Eve in Quang Ngai and am expecting to see something that I did not see yet. If I am in Ho Chi Minh City, where I work and live, I’ll celebrate it in the Cuban consulate with my fellow citizens, eating Cuban food. We also celebrate the victory of the Cuban Revolution on January 1, 1959. If I had a chance to celebrate in Cuba, I’d spend the day with my relatives in a family atmosphere. ​My New Year wish is more prosperity for my second homeland and its citizens. I also wish the leaders of my motherland ​more opportunities to learn more about the success of this beautiful country that shares our political point of view. Tonight is New Year's Eve but I have no big plans. We will go to the bars around here in District 7, Ho Chi Minh City to find where the party people are, and wait for the countdown. Last year was a bit special, we went to Hoi An with friends to celebrate the new year and we were surrounded by beautiful colorful lanterns. Fireworks were amazing! I guess it's going to be busier but better in 2016. I just hope that Vietnam, despite its fast development, would stay cool and raw. I'm still positive that Vietnamese people are not going to change their way of living. Michael Katkin from the U.S. This will be my first New Year’s Eve in Vietnam and I am pretty excited. Overall, I think the celebration and partying itself won’t be too much different from my past New Year’s Eves spent in America, but the fact that it marks my first time celebrating outside of the USA and pretty cool milestone (10 months in Vietnam) makes it that much more significant. At home, my New Year celebrations have always been a blast. I’ve always been in a large city (Washington, D.C., New York, Pittsburgh) during New Years so usually friends will take advantage of their time off from work and come in from out of town to visit. We’ll start off by having some drinks at someone’s house or apartment. Afterwards, we’d usually go to a club. The past year in Vietnam has been nothing short of amazing. While I’ve traveled and lived abroad before, moving to Vietnam was my first time in Asia so adjusting to the culture here, while a bit difficult at first, has been a pretty amazing experience overall. I’ve made friends from all over the world, learned a bunch of Vietnamese, started doing some voice-over work, been an extra in a couple movies, camped on deserted beaches, and caught some of the most amazing sunsets. I don’t have many New Year wishes. Obviously, I want all my family and friends to be happy and healthy. I’d also be a liar if I didn’t admit to the cliché wish of “making new friends and continuing to travel.” Mostly, though, I’d just like to keep taking advantage of everything there is to do on this side of the world in order to help me figure out what I want to be when I grow up.